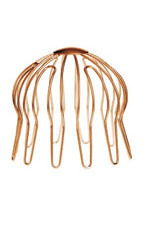 Can be “snapped” on and seamed, soldering not required. 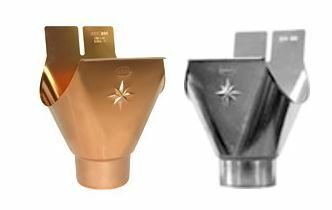 On our website you will find all the components of our high-quality, European-designed, rainwater system in copper and VMZinc. 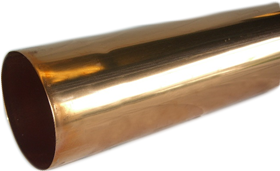 Our Copper and zinc gutters are made right here in the USA. 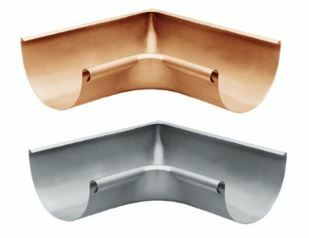 There are less than a handful of Copper Gutter Distributors who can say this. 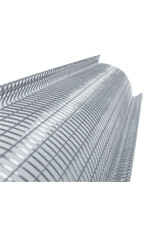 Our half round gutters come in a variety of sizes and are easy to install. 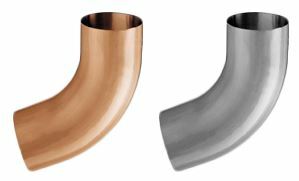 What makes our copper gutter and zinc gutter system different is our traditional forward-bead and rear-edge that is canted away from the fascia. 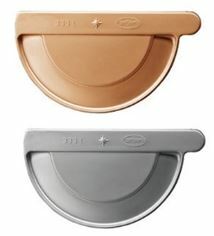 This helps protect the fascia board, walls and foundation of the home and leaves behind less leaves and debris. 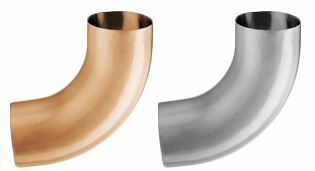 Ornametals Manufacturing, LLC is the only company to produce copper and zinc seamless weld downspouts in the United States, that complements the European-style half round gutter system. 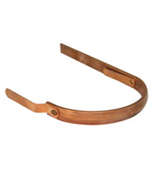 Whether you’re looking for fascia or roof mount hangers to hang with your copper gutters our copper gutter hangers are strong and built to last. 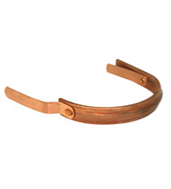 We recommend a hanger for every 2 feet of copper gutter installed. 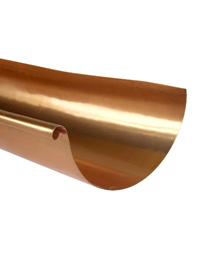 Available in Basic or Star, our Specification and Installation Guide comes with a template to use with our copper gutters when installing the gutter outlets. 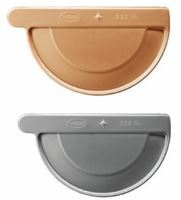 Star Outlets can be used as an expansion joint and with any half-round gutter, contact us for flow rates. 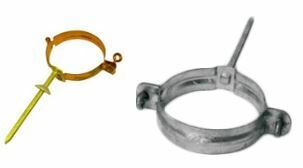 We offer the option of using a bracket with a bolt screw or a pin when installing our seamless downspouts. 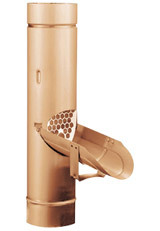 It is important to place a downspout bracket at the top, bottom and for every 10 feet of seamless downspout that is installed. 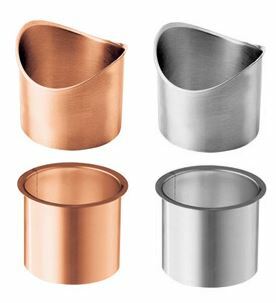 Our seamless copper elbows, like our downspouts, have an invisible and very strong weld where the ends are butted up against each other and then accurately welded. 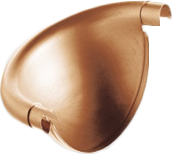 Not only is the fit of our elbows the best in the industry but they are designed so that the male end fits tightly into the female end of a “cut” downspout, full length downspout or another elbow. 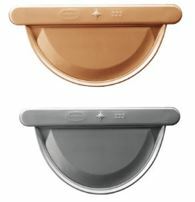 Our half round gutters, downspouts and accessories come in a variety of sizes and are easy to install. 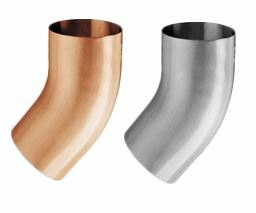 It’s time to upgrade your old guttering system with a fresh, ecofriendly and aesthetically pleasing new look. 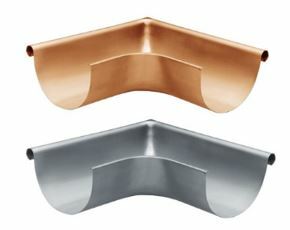 Try our copper and zinc gutter today!